Our farm and greenhouse are located north of Mitchell near Monkton. 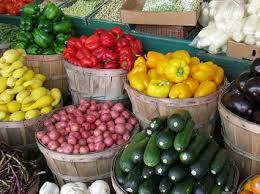 We grow a wide range of vegetables, which we make available year round at the Market. We also grow grow in our greenhouse through the winter season with no heat (just the sun warming them up!) and make available the spinach, greens, carrots, and onions to our Stratford customers. We also outsource other seasonal vegetables to keep things fresh during the winter season. We are able to store potatoes, onions, beets, carrots and other veggies to keep it all local. Come see us Saturdays, shop local, buy fresh and talk to a farmer!